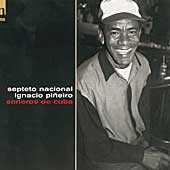 Ignacio Pineiro & Septeto Nacional - "Soneros de Cuba"
At the end of the 19th Century in the sugar cane and coffee plantations of the Cuban 'Oriente' region, two different music styles began to combine: the rhythms of African slaves and the songs of Spanish heritage. The result was a new music: the Son Oriental whose popularity, in the beginning, was limited to the rural areas of its origin. Officially it was classified as frivolous and indecent. However, its fame spread quickly to the urban neighbourhoods of the main cities in the region....A young musician named Ignacio Pineiro still was not satisfied by the existing sound of the Son groups. This sound was mainly based on vocals percussion and strings. Thus in 1927 he created his own group: The 'Septeto Nacional' adding, for the first time in the history of Son, a trumpet as lead instrument.